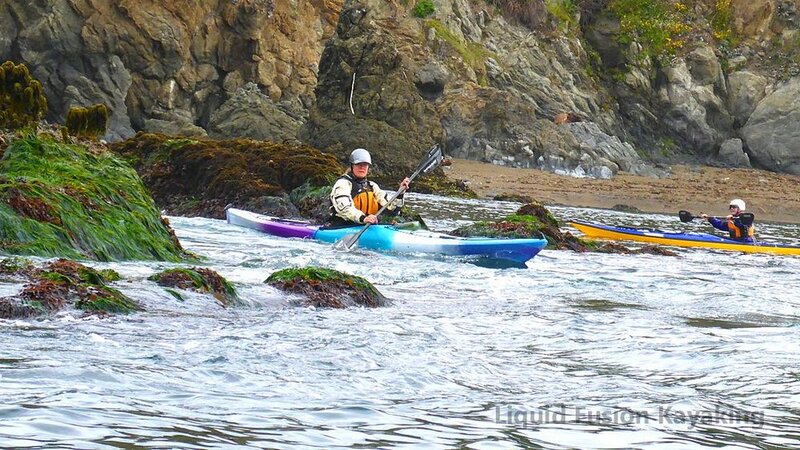 Learn to sea kayak on the beautiful Mendocino Coast! This class is a great first sea kayak class or a refresher for those who want to improve their technique. Day one is foundation sea kayak skills instruction including maneuvering strokes, forward and reverse strokes, safety, and rescue skills. The skills instruction is focused on easy and efficient use of body, boat, and blade. Day two is a journey from the estuary out into the ocean. During this journey, we will be refining skills and applying them to the ocean environment. Over the course of both days, we will be watching wildlife, checking out coastal rock formations, and enjoying the beauty of the Mendocino Coast. This is a great opportunity to kayak with LFK on both the Noyo River, the Noyo Harbor, and the Pacific Ocean. Students have the option of using a decked sea kayak or a sit on top touring kayak for this class. We recommend doing both days but students may opt to do only one. Day one or a comparable course is required before doing the ocean journey on day 2. $299/person includes kayak and equipment rental for the class. Art of Sea Kayaking 101 is available April 20-21, 2019, June 8-9, 2019, and by appointment.